I’ve been playing tour guide again, and I love it. Enter Sally Nankivell, a visitor from Grand Marais (my home town). 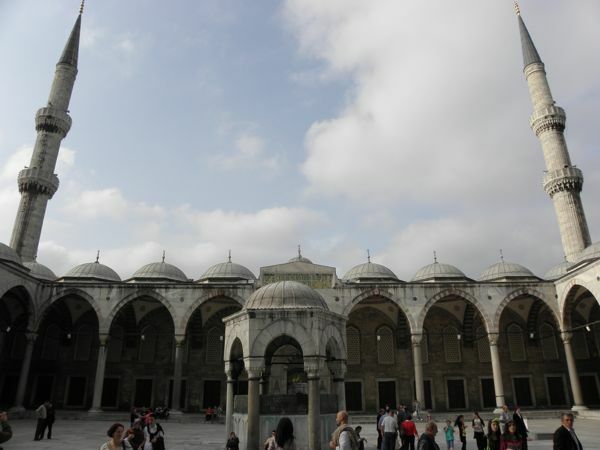 She’s been reading my weekly missives for years now, and decided it was finally time to trek to Istanbul. Heck, a free room on the Bosphorous and an eager host? It’s a no-brainer! I was tickled when she booked a ticket last summer, and now she’s here. 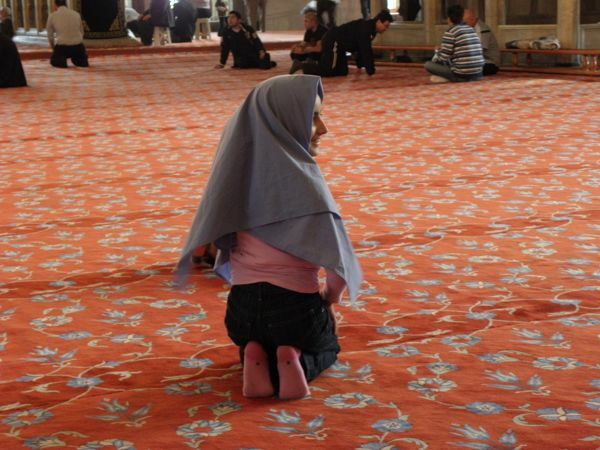 Sally slept until eleven Sunday (after a sleepless night), then we headed into Sultanahmet to see the “usual” sites. She had delivered a new camera for me (my old one died a painful death in September), and I was eager to give it a whirl. It’s my third version of the same Olympus, this new model cheaper than the other two. Anyway, instead of the expected 10X optical zoom, this one has a 26X zoom as well as a wide-angle lens. Oh, my! Ask me if I was thrilled. 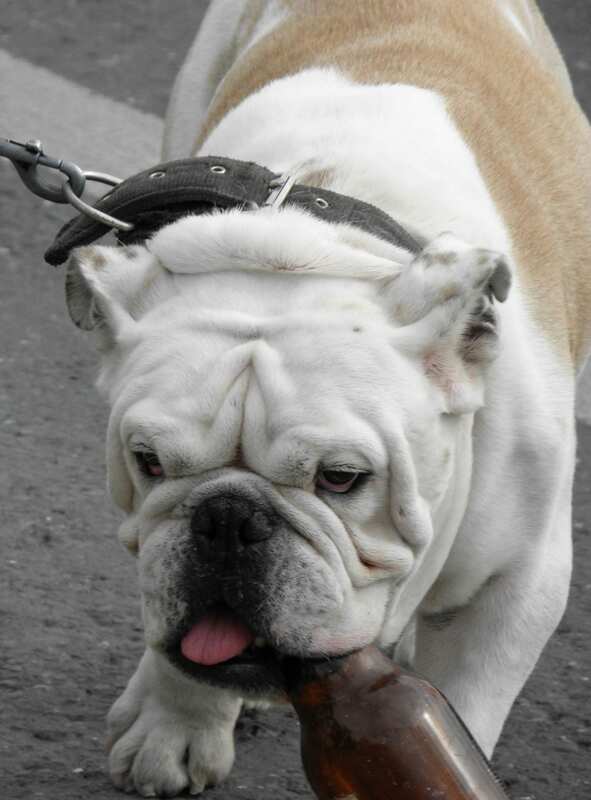 A fellow crossing the road at the bus stop in Arnavutköy–must have been a rough night. 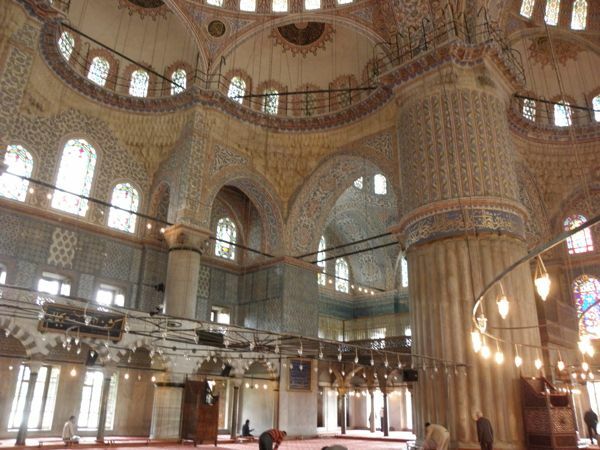 So—we spent a fair amount of time snapping photos inside the Blue Mosque, then I lured Sally over to a well-hidden gem that few tourists discover: Yerbatan Sarnıcı, The Basilica Cistern. It was one of my favorite discoveries on my first trip into the city, and I love sharing it with visitors. You’d never find it if you didn’t know where to look, as the entrance is a small stone building just off the tramway. The entrance is the only nondescript thing about it, though. Once through the entry, you descend a wide stone stairway into a subterranean wonderland. The ceiling of the Cistern from the stairway landing…awesome! The cistern is a huge underground “lake” of water originally conveyed by aquaducts from the Belgrade Forest, 19 kilometers north of the city. 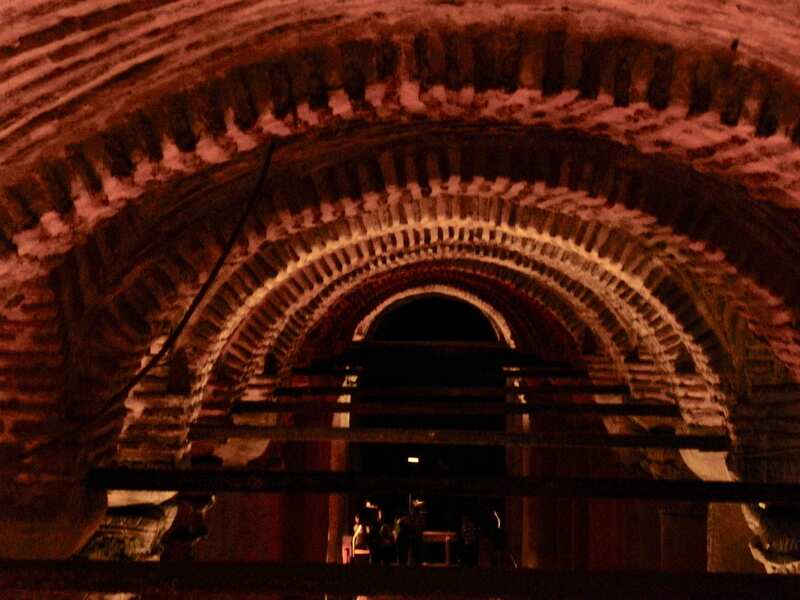 Built in the 6th century by the Byzantine Emperor Justinian, the cistern consists of a network of hundreds of vaulted brick domes supported by 30-foot marble columns. The cistern’s 336 columns are believed to be recycled from older buildings in the area because they are of mixed design. Most of the columns have ornate Corinthian capitals, while some are Doric and Ionic. I guess it wasn’t all that easy to find 336 matching columns back in the day. 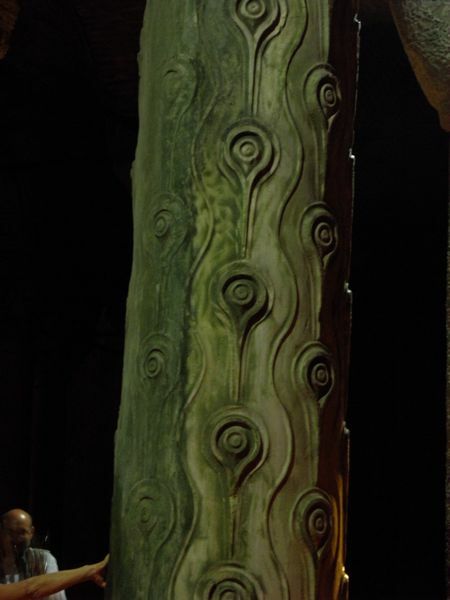 My favorite is the peacock column, or the “tears column,” decorated with the motif of peacock tail feather eyes. It also has a thumb-sized hole in its side. You place a thumb in the hole, make a wish, then rotate the rest of your hand in a full circle. I guess then the wish comes true. Right. Imagine semi-darkness, medieval background music, dripping water, and wooden walkways through a forest of gently lit columns. 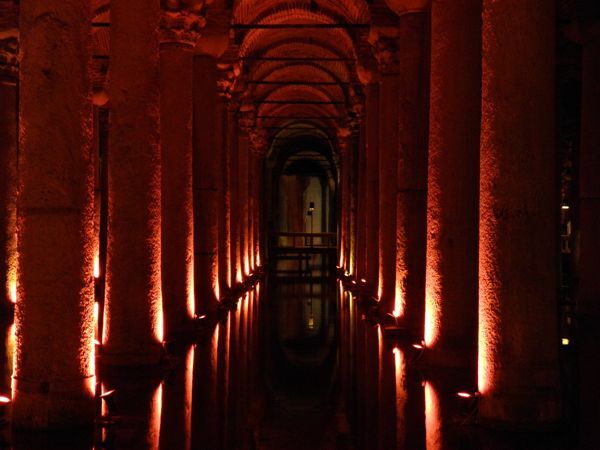 Few things in Istanbul transport me back quite like the cistern. Sally and I meandered back to the mysterious gorgon Medusa heads. Apparently they weren’t discovered until the mid-1980’s when the cistern was renovated to accommodate tourists. Two ancient marble Medusas (one upside down and one sidways) serve as the bases for columns in a far corner of the cistern. Remember Medusa, the goddess with hair of snakes whose glance would turn people to stone? 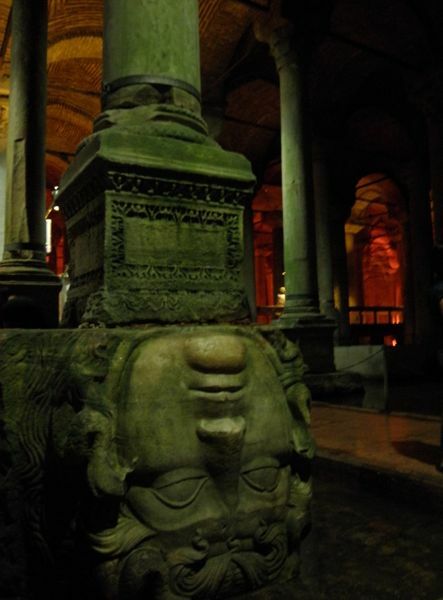 Yup, that’s her—right there in the Basilica Cistern. Go figure! The cistern has another claim to fame, too. It was used for a scene in From Russia With Love in 1963. Although it was located far from the Russian Consulate, few people realized the discrepancy, and it made for a great chase scene on the water between the columns. The cistern once provided water for Topkapi Palace and its gardens, but it eventually went into disuse. During the final restorations of the mid-1980’s, over 50,000 tons of mud were removed to bring the cistern back to its original state. 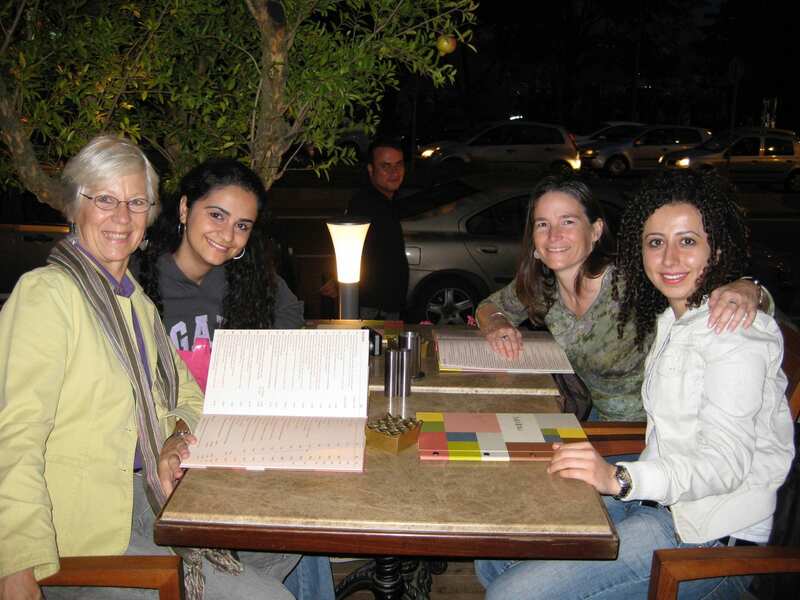 After that, Sally and I relaxed with a cup of tea at the Caferağa Medresesi, another favorite spot where the ancient classrooms and sleeping rooms of a medieval Koran school are now used to teach the fine arts of ceramic painting, ebru (paper marbling), miniature painting, ceramic design, jewelry making and many other art forms. It’s a peaceful little spot in one of the busiest parts of the city, humming with the quiet activity of artists. 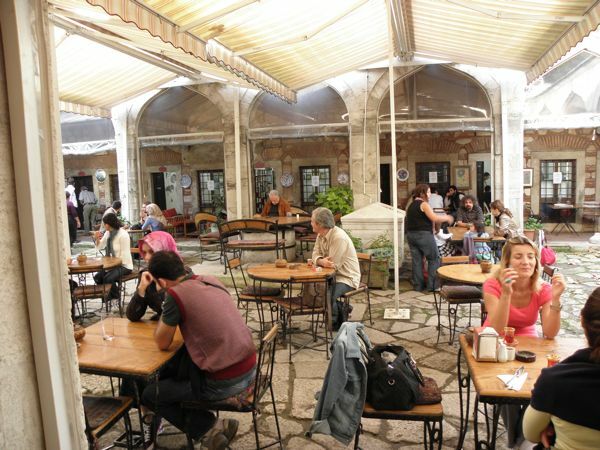 The tea courtyard at the Caferağa Medresesi, with classrooms in the background. 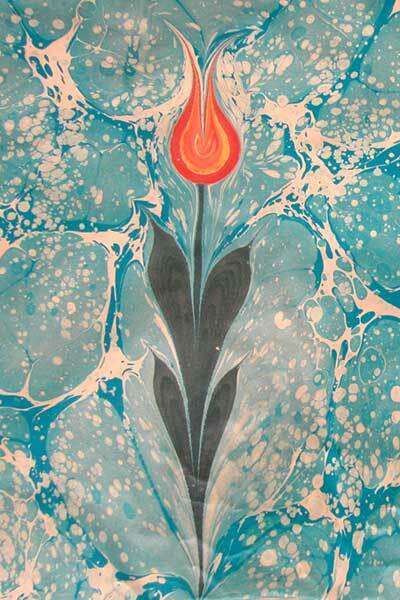 The fine art of ebru, or paper marbling, is taught here. 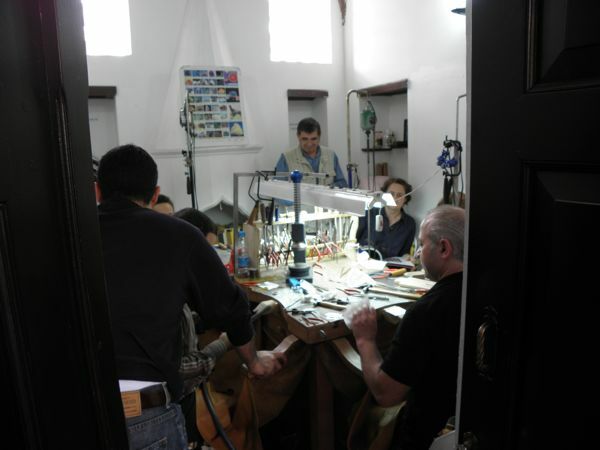 A jewelry class crowded into one of the tiny classrooms. 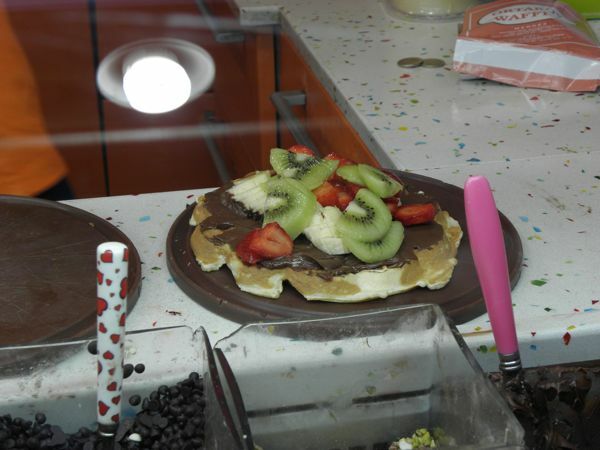 Our fruit waffle–imagine it all rolled up. YUM!!! 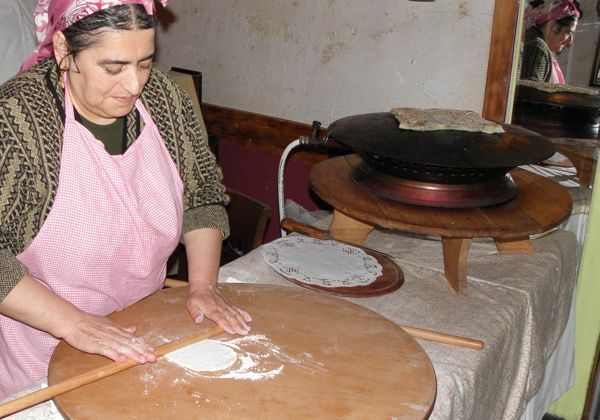 This dear woman made us gozleme, a meal-in-a-minute. She’s rolling filo-like pastry (yufka), which will be spread with cheese, potatoes, and spinach, then folded into an envelope and fried. There’s one on the cooker behind her. Next post“Termal” means Thermal—as in SPA!! !